We are one among the prominent manufacturers and exporters of best quality Tail Breaker. The offered product has fetched high demands for its longer service life and resistance to abrasion. Attributing to its anti-corrosive properties and perfect finish, the whole range of high quality tail breakers offered by us has been a preferred choice of our revered clients. We are an eminent name occupied in offering premium assortment of Hydraulic Rock Breaker for Construction Sites to our clients. Additionally, client can get the offered products from us at very economical prices. Hole Size Required: 1 3/4", 1 3/16"
Hardgrave Index: 55 to 70. We are involved in providing quality assured array of Hydraulic Power Breakers. We are a renowned name, which is engaged in offering a wide and comprehensive range of Rotary Coal Breaker . 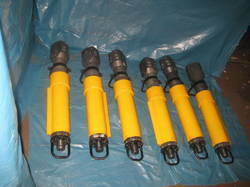 Nowadays the hydraulic breaker technology has reached to its peak, and more people have come into the industry. But it does not mean all of them are capable of supplying such technology and still some of real specialists can see the core of technology. We developing adaptation kits as per Customer requirement and install at sites in all over India. We have the required details and drawings to assemble adaptation kits for all models of L&T Komatsu, Tata-Hitachi, Cat, JCB, Terex-Vectra, Volvo, Hyundai, L & T Case, BEML, Doosan, Kobelco, etc. There is a team of qualified Engineers to install and commission the kit at site. The medium and Heavy range Montabert Hydraulic Breaker are designed for use on large backhoe loaders and excavators. 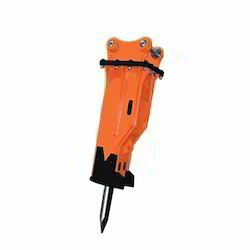 With superior power-to-weight ratios, these breakers can effectively break oversize boulders, excavate and demolish concrete. In addition, these breakers feature a patented energy recovery valve that recycles recoil energy and adds it to the next blow. We offer a wide range of Tail Breaker that is manufactured using state-of-the-art machines and latest technology.